Mitsubishi Electric has unveiled a new generation of its FX compact PLC, with the claims that it is three times faster, and will cut running costs and energy consumption. At the recent SPS IPC Drives show in Germany, the company also launched a new version of its high-end iQ series modular PAC (programmable automation controller), which can control up to 192 axes and is said to cut development, maintenance and operating costs. The new Melsec FX5 PLC is the latest in a series of controllers dating back more than 30 years. 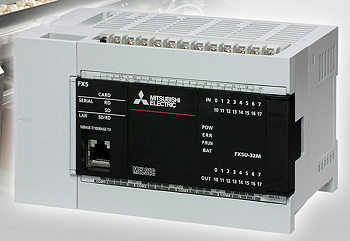 More than 13 million of them have been sold over this period, making the FX series the world’s most popular compact PLCs, according to Mitsubishi. The new generation can perform more complex positioning tasks without any extra modules and can control up to four independent axes of motion. Functions such as fast counters and pulse outputs up to 200kHz are built in, along with an Ethernet interface and analogue I/Os for PID controls. The controllers (above) are available with 32, 64 or 80 I/O, and can be expanded up to 256 I/O by fitting expansion modules, or up to 512 I/O via networks such as CC-Link, CC-Link IE Field, Ethernet, Profibus and Profinet. The controllers can operate on 100–240V AC or 24V DC supplies, making them suitable for worldwide use. There is a choice of digital relay or transistor outputs. The FX5 is backwards-compatible with the existing FX3 range, allowing easy, cost-effective migration from the earlier controllers. Using a bus converter, FX3 expansion modules can also be used with the new PLCs. A SD memory card slot can be used to record production data and to simplify migration to modular PLCs. The new successor to the Melsec System Q high-performance modular controller – know as the iQ-R – is designed to improve performance, add extra functions and increase safety, as well as cutting development, maintenance and operating costs. The PAC, which has an instruction processing time of 0.98ns, is due to reach the market during the second quarter of 2014. The new safety and security functions include an extra security hardware key, an IP-based access filter, and user authentication. Improved debugging and error-recovery functions will simplify commissioning and maintenance. Operating histories can be created, in addition to error and event logging, high-speed recording of analogue data, and a database for storing recipes. The iQ-R series can be programmed using the new GX Works3 software which will be part of the iQ Works integrated engineering environment. New options include dynamic labels, parameterisation instead of programming, and the automatic creation of hardware function blocks as well as visual function blocks, including HMI templates. The modular multi-CPU system is said to be faster and more efficient than its predecessor and uses synchronised output modules as well as synchronised PLC and network scans. Standard and safety control systems can be combined on one rack and the PAC can connect to networks such as CC-Link, CC-Link IE Field, Profibus, Profinet and various third-party networks. An SD card slot allows production data to be recorded and processed, as well as storing system parameters, including those from intelligent modules and devices connected via CC-Link IE Field. The new controller is also equipped with digital safety I/O modules. Like the FX5, the iQ-R is backwards-compatible, enabling the continued use of Q series programs. Terminal compatibility cuts wiring costs, while adapter carriers allow Q series modules to be re-used.